1. 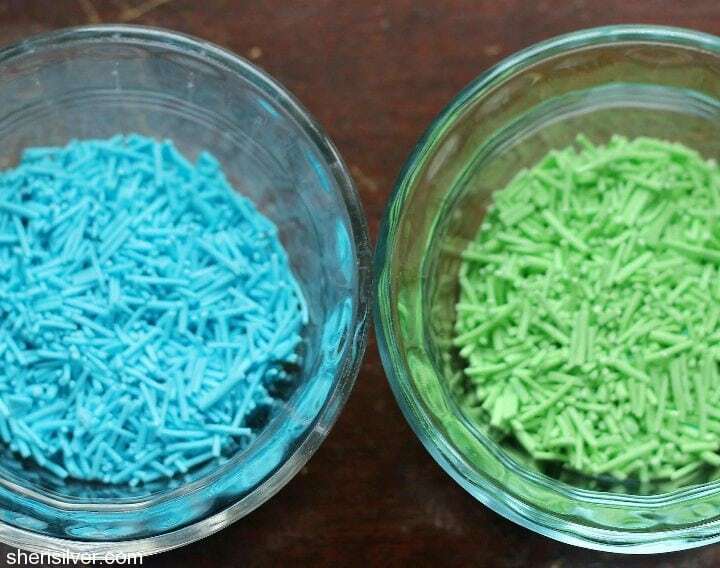 Have you seen the ingredients in commercial sprinkles? Carnauba wax? Cellulose gum? Trust me, there is truly no comparison between something artificial and commercially produced versus something – anything – homemade. 2. You can customize the color to match your party theme, school colors, or a child’s favorite shade. How cool is that? 3. You can flavor them (mint? vanilla? lemon?). You with me? Good! So, without further ado………..SPRINKLES (click here for chocolate sprinkles)! But you could also use a tip with a small single hole (like a Wilton #2), with equally great results. 1/4 teaspoon flavoring or extract of choice – vanilla, almond, etc. Sift the confectioner’s sugar into a medium bowl. 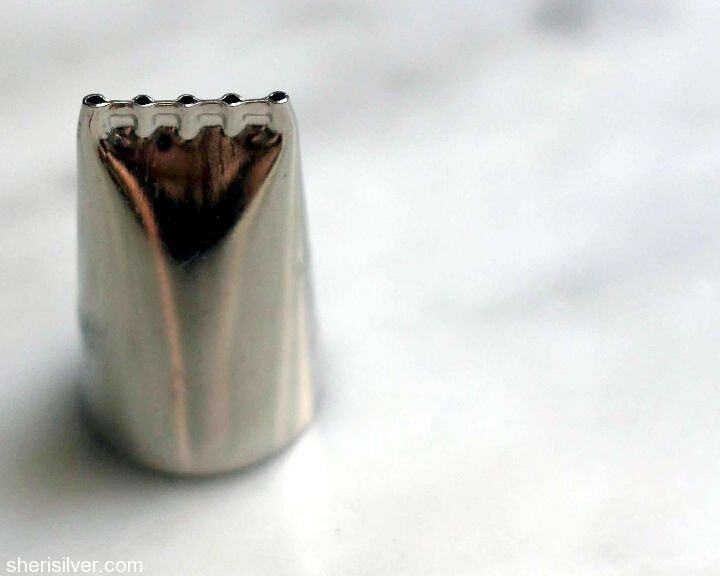 Do not skip this step, as even the tiniest clump of sugar will clog your piping tip. In a small bowl whisk Just Egg Whites with water till foamy. Whisk in extract and salt. Add to sugar and whisk till smooth. It’s a little tricky to get the right consistency – you don’t want it to be at all liquid or “pourable” – it should be smooth but very thick, so that the lines don’t spread when you pipe them out. If it’s too thick you can add more water (in 1/2 teaspoon increments) – if too thin, add more sugar. 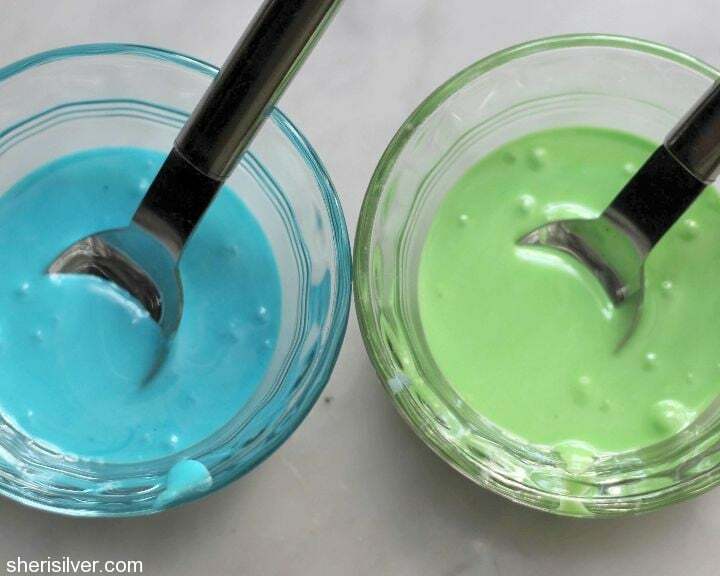 Using your food coloring, tint the icing till you achieve the desired shade – you can even divide it to create multiple hues. Place the icing in a pastry bag fitted with your tip. Pipe out icing on prepared baking sheets. 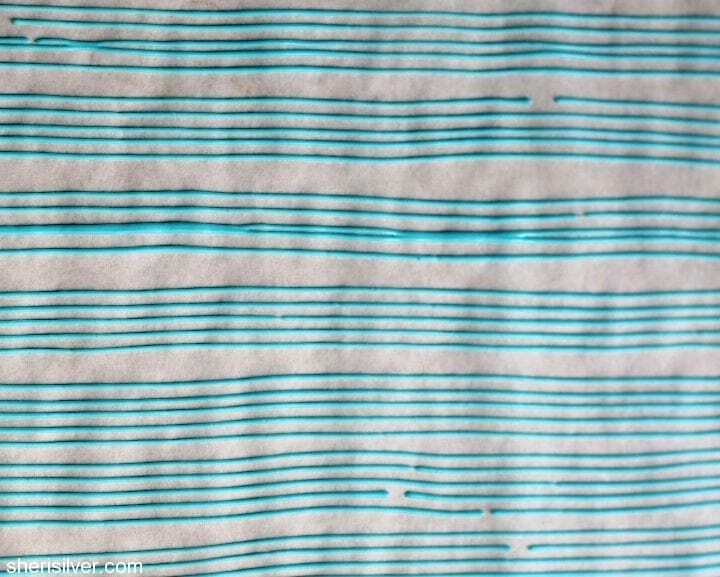 Don’t worry if the lines aren’t perfectly straight, or if there are breaks as you pipe them out. Let the icing dry – uncovered, at room temperature – for a full 24 hours. Lift the parchment paper off the baking sheet and place onto a cutting board. Slowly curl the paper up and away from the icing lines to release. Gently slip them onto the cutting board and discard the paper. Line them all up and chop into desired lengths. Use immediately or store in an airtight container. Great idea and SOOO much easier than I would have expected! Love that you can flavour them too. I too LOVE sprinkles but refuse to buy them because of the ingredients! I never have but I don’t think so. That said, maybe try a test batch first? And please let me know the results; I’ll add it to the recipe! This means that I can make them for my man … his corn allergy means no processed sweets, I make my own confectioner’s sugar anyway. Thanks for sharing! Super easy too – have fun! I am soooooo on this…..like sprinkles to ice cream. Hi…how can I make chocolate sprinkles? Would love help and recipe! I’ve not made them (yet!) but this will be the recipe I use: http://bravetart.com/recipes/ChocolateSprinklesGF Let me know if you try them!! SO cool! Do they have the same consistency as store-bought sprinkles, or are they crunchier? 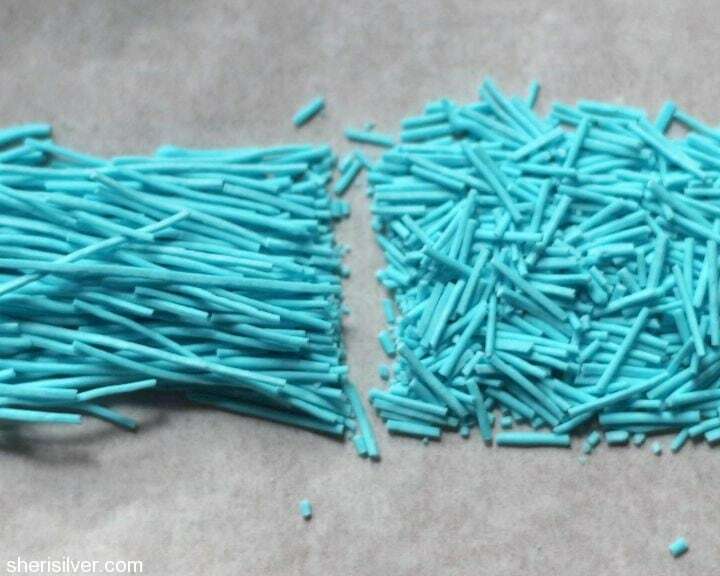 I saw your ombre sprinkle picture on Instagram – beautiful! That’s awesome! Will add some bit of color to a chocolate cake, the kids are going to luv this!! Thanks for sharing!!! Great idea! Seems like you could use a new garlic press for this too. An old one might still retain some odor or taste of garlic. Ooh – never thought of that! Great idea! Wow, I love this!! 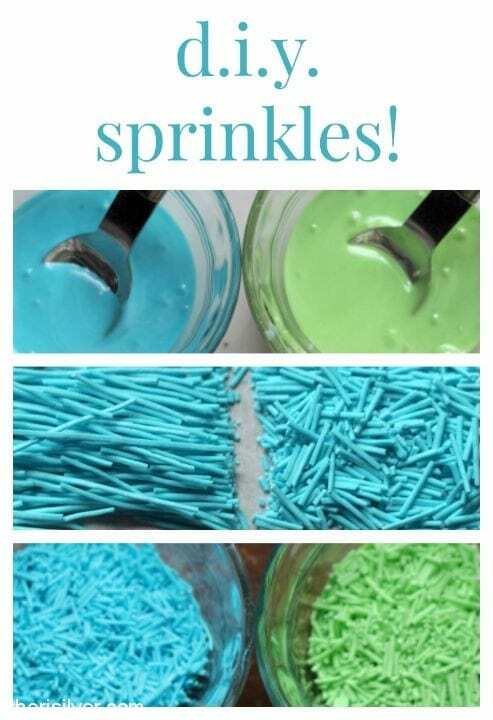 Never thought of making my own sprinkles before! Could you sub real egg white for the “Just Egg White”? And if so, would you use the same amount? I’ve never seen “Just Egg White” here! You could – for safety reasons I used the egg white substitute. Two teaspoons of of “Just Whites” is the equivalent of 1 regular egg white. So you’d want to use half of an egg white in the recipe. Let me know how they turn out! How long do they store for? Do they need refrigerated since it has egg whites in it? I use powdered egg whites (which allows the sprinkles to be stored indefinitely) for that reason. Any recipe I’ve seen for sprinkles indicates that as long as they’re stored in an airtight container that they will keep indefinitely – regardless of real or powdered whites. If you’re antsy about storing egg whites at room temp then I’d put them in the fridge; I’m not sure how the texture will be affected though. Let me know what you wind up doing! I half expected to see a grater or potato ricer had been used for this – now I’m wondering what effects could be achieved using kids’ play-doh extruders. I may just have to buy some and find out. I can always pass them along to my grandson if they don’t work out! Do you think I could stiffen the mix a little with more sugar or with a bit of cornstarch, then slice stars etc. from an extruded shape? Interesting idea! I think that the recipe is very adaptable and you could probably stiffen it with more sugar – let me know if you do and how it turns out! How can I make chocolate jimmies?? Are. “Just Whites” a powdered substitute? None of my local store carry it. Thanks! Yes – it’s a powdered egg white substitute – pasteurized and kept at room temp. You can absolutely use egg whites instead, I include that for those who are reluctant to use raw egg. Can meringue powder be used in place of egg white powder? You could but you might have to play with the amounts as meringue powder has other ingredients in it that might affect the consistency. If you use it let me know and I’ll add it to the recipe! Loved this easy, better way to have sprinkles – thanks! Ugh – saw your tweet – working on it right now!!! Hi! I’m Finnish so I just have to ask what the small t and big T stand for in recipes? I go to a fricking culinary school and I still have no idea, because our English teacher isn’t actually an English teacher (for example she thinks that the american “cup” stands for a coffee cup and nobody would believe me when I said that a cup is 2,4dl, because I’m the youngest in my class). I really need to make sprinkles for my next bday cake, I don’t normally even like sprinkles, but maybe I will if I make them by myself. If you use a real egg white instead of the “Just Whites” do u take out the water? Or do u still need to use it? Yes you can skip the water – you made need a little to thin out the mixture if it’s too thick! Just a thought, but could you make a thicker frosting like fondant and push it through a sieve? Have no need for sprinkles right now or I would try it! Ooh – that’s a great idea! Let me know how they turn out! I believe I found it in my local Chef Central – but you can order it directly from Wilton: http://www.wilton.com/store/site/product.cfm?sku=402-134 . Hope this helps! What is the texture like? Are they very different from the store bought kind? They look so fun! Very cool. I am very impressed. I’m so glad that that I stumbled across your blog. I’m trying to conquer my unnatural fear of baking and I think you are going to help tremendously. Lol. Thanks for sharing. Hi again. Today was the big party, and the cupcakes looked wonderful, thanks entirely to the homemade sprinkles. I have a picture, but I’m not sure how to share it with you. There isn’t a way, that I’m aware of, to upload it in a comment. Yay! E-mail it to me at Sheri at sherisilver dot com. I’ll put it in the comments! As you baked the cupcakes with the sprinkles inside, the heat sort of “liquefied” them into what you’d typically see in sweet “drizzle”/icing (the kind you may see atop cinnamon rolls and the like)… and the little “dots” you saw was simply the lingering coloring used in the sprinkles. Regular (store bought/icky) sprinkles add a variety of “waxy” preservatives with a higher melting point than plain confectioners sugar and egg whites, etc. I’m just guessing that the homemade jimmies turned to delicious flavored icing as it baked, is all. Ugh – I’m sorry to hear that – I’ve never had that happen! Did you sift the sugar? It’s critical for this recipe. Also, your sugar might be extra “dry”. Start with less sugar and add more – a little at a time – till you get the right consistency. Let me know what happens! And also those are the exact colors I need! What colors did you use?! Ugh – I wish I had exact answers for you – I’m planning another batch soon and will make note of the final amounts! As for the colors, I just eyeballed using gel paste food color – good luck! And I love that there’s people like you out there, willing to share ideas, tips and tricks. Hugs back Frida – thank you! And tune in tomorrow, ’cause……………CHOCOLATE SPRINKLES!!!! Is this basically royal icing? Do you have to worry about salmonella using egg whites? Is the powdered egg whites you use the same thing as meringue powder? Not exactly – some (if not all) meringue powders contain sugar and/or cornstarch. Powdered egg whites are just egg whites. I hope that helps! What does one T mean? Like in one t of egg whites? This idea was passed on to me buy my mother as my kids love sprinkles. But i used the recipie but let the kids draw and make the patterns and when it drys we will cut them up to eat for lunch. Kids are excited. So thankyou for the recipie and great craft/cooking experience. Love this helpful recepie. Super awesome post. Please share all ur fabulous recepies. I am wanting to save money on decos and making my own is even better to learn. Thankz! Any idea roughly how much this mix makes? I’ve never measured but I believe it’s 1 – 2 cups! Hi, can these be mixed into a white cake to make your own confetti cake? I have made several custom confetti cakes using different colors of jimmies or sprinkles. This would be great to be able to make exactly the colors I want. I don’t know what would happen if baked – I’ve never done that before and would be concerned that they would bleed. That said, could you do a test batch (like with a cupcake)? Let me know if you try it and how it turns out!!! This is awesome! 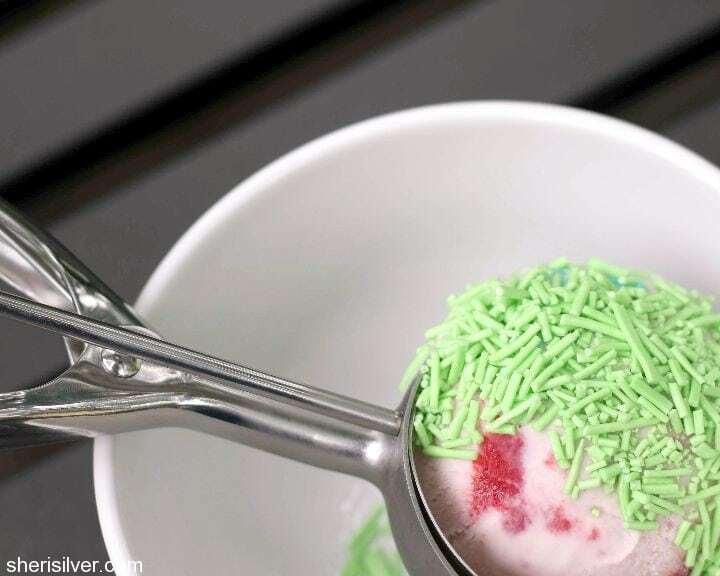 I’ve never even thought of making my own sprinkles. It doesn’t look like it’s too hard, either. I will definitely have to try this. Where I was born & raised (Pittsburgh) we called them “Jimmies” —and yes, that is the same as sprinkles! lol But I can’t wait to try these for the grandkids, they love their sprinkles on their cupcakes!